Leading Manufacturer of hydraulic tyre killer, one way tyre killer, road spike barriers, spike barrier, portable tyre killer and electro hydraulic tyre killer from Pune. Parth System Patriot PSIPL 100 is a third generation Tyre Killer. Its unique design combines a Fail-Safe Puncture tool. Made from Hardened Carbon Steel, the puncture tool allows the compressed air to rush out, thereby deflating the tyre immediately. The spikes have been designed to ensure that tyres of intruding vehicles are punctured irrespective of the direction of approach. It can disable all types of tyres, even third generation flat tyres. It has further been crash tested in one of the armed force location wherein the 4 radial tyres of an intruding SUV were damaged imtantaneously. Feature It is fitted with heavy duty hook and rope on both sides. It is a portable barrier specifically designed for Police and security personnel to stop vehicles instantly. It is an inexpensive tool which can be rapidly deployed in seconds at a road block oralternatively, it can be used semi permanently to protect an important building. Any vehicle passing over the Spike will have its tyres instantly punctured by 100MM spikes which will disable the vehicle quickly, safely and effectively. Spike-It is very ruggedly constructed from hardened galvanized steel with stainless steel fittings. Its operation could not be simpler - simply slide it out of its carrying case and fold it out to its fully extended length of approximately 6metres. 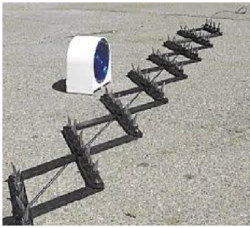 An alternative method of deployment is for Spike-It to be left in its case at the side of the road and pegged into the ground by using the two metal pegs provided. If a vehicle then tries to charge through the road block, Spike-It can be quickly deployed in a matter of seconds by an operator pulling it across the road with the length of thin cord that is provided with the equipment and is attached to its carrying handle. Spikes will be folded back into its case, enabling a number of units to be carried in the back of a vehicle. This equipment can easily be modified to meet a client's specific requirements. * It is available in 10ft, 15ft, 20 ft length to cover across the road. * It is fitted with heavy duty hook and rope on both sides. * The spikes are mounted on main frame in a systematic way. * The main frame is made of 6mm thick flat aluminum strip which made it corrosion resistant,strong and light in weight for easy portability & long durability. * 5 Nos. 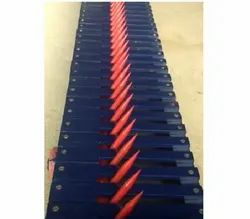 of spare spikes are also supplied with the equipment free of cost. * Spare parts like extra spikes / frame / box /wheels can also be provided on demand at extra cost. No. of Spikes Approx 128 Nos. Total Weight Approx. 7 Kg. Parth Systems Tyre Killer is a Third Generation Tyre Killer. Its unique design combines a Fail-Safe Puncture tool. Made from Hardened Carbon Steel, the puncture tool allows the compressed air to rush out, thereby deflating the tyre immediately. The Spikes have been designed to ensure that tyres of intruding vehicles are punctured irrespective of the direction of approach. It can disable all types of tyres, even third generation flat tyres.